modifications: When knitting the plain knit round before starting the toe decreases, I decreased 2 stitches at either end of the lace pattern going over the foot, leaving me with 64 stitches, and then I knit a standard round toe over that. I think I have pretty much established that I am an unabashedly selfish knitter. Or maybe lazy more so than selfish. Or perhaps a combination of those two. I generally don’t do swaps, with just a few exceptions, but that’s partly because I fear that I won’t make the other person something as nice as they would make me. And I don’t knit people gifts because of a few experiences where my handknit presents were less than appreciated. Ahem, I’m not referring to my beloved sister at all… not at all…. So I am fine with knitting for myself and only myself. Except lately, there seems to be a shift. Maybe it’s because of all that hope and promise and good stuff floating around in the air these days…. Maybe it’s because Matt keeps telling me how much he loves the socks that I have knit for him and how he keeps wearing those two pairs over and over and over. Lest anyone think my desire to knit for Matt is entirely selfless – oh no! When dealing with me, flattery will get you a pair of handknit socks. His love and appreciation for the socks I knit him have totally stroked my knitting ego. Well, that and you’ve gotta love a guy who when presented with several different pattern options for socks chooses a lace pattern because he’s heard you say that you love to knit lace since it’s fast and easy. Dude, he’s been paying attention and crap! He is definitely sock-worthy. Unfortunately because our photo session was a little hasty, with Matt rushing off to capoeira class wearing the socks, I wasn’t able to photograph one of my favorite details of this pattern which is the way the pattern continues on the heel. Maybe I’ll post it later on at some point because it truly is lovely. Besides, I need to start blogging again. I just realized I have about 6 posts that I thought I had posted but apparently I still have to fix up and edit. Ugh, such a slacker! Also, I have to gush about the Pigeonroof for a moment. I had to use this yarn as soon as I got it into my hands, it is that gorgeous and the texture is that heavenly. 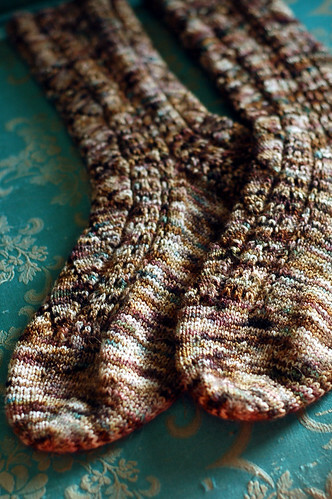 The colorway was perfect for this pair of socks because the colors are just so “Matt.” The lack of pooling (YAY!) allows for this to be knit as lace without the colors being too distracting and overpowering the pattern. The finished piece is so squishy and fabulous. Seriously, I could go on and on about how much I love this yarn. Love it! Hope you’re all having a lovely weekend! Matt’s flattery was not wasted – those socks are absolutely gorgeous! The yarn is so beautiful and well-behaved. Well he certainly sounds like a sock-worthy dude. Great job on these. I love sock sites, but have yet to make my own. Keep the inspiration coming! I never comment here, and am a lurker for the most part, but your posts are so wonderful and they really must be made more frequently!The socks are fabulous too, all your raving about Pigeonroof makes me want to try it asap. Those are gorgeous! I love Pigeonroof yarn too. Extremely nice!I’ve seen the pattern but where?I’d take a pair of them too. Those are awesome socks! Matt is definitely worthy! those are beautiful socks and matt is definitely sock worthy.